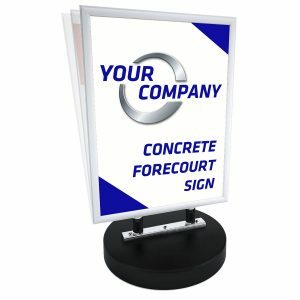 We have just added a new range of heavy-duty forecourt signs, with concrete bases that guarantees stability with only a small footprint. The added steel springs offer panel movement to aid stability in windy conditions. Our concrete base waterproof forecourt signs are ideal for external use in all weather. The waterproof glazing panel means you will not get faded or water damaged posters, making them ideal graphic signage displays. 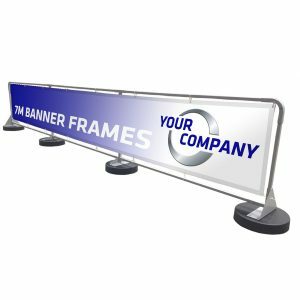 Our concrete base outdoor banner frames are manufactured from a robust metal, making them ideal for use with PVC eyeletted banners. They come with 4 concrete bases and the banner frame size available is 1m x 7m wide. All of our PVC banners are produced using advanced printing techniques to produce a high quality, full colour print. Also, we offer double sided banner printing, so ideal if you want to capture the attention from both sides of the banner.